Woodstock Deja Vu All Over Again! Just delivered to me from the publisher…the perfect holiday gift for 60s classic rock music lovers everywhere. 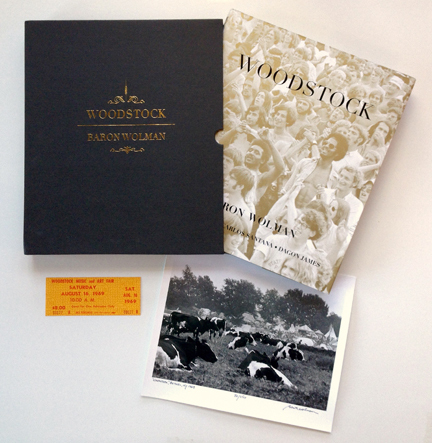 • A Limited Edition copy of “Woodstock,” the widely-praised hardbound book nestled in an elegant custom slipcase with gold embossing. Only 250 copies of the Limited Edition have been or will ever be produced. • The Book itself contains much more than photos: a) Over 75 images from the 3-day festival; b) An exclusive 14-page interview conducted by editor Dagon James with me and Michael Lang, concert promoter and co-creator of Woodstock; c) My complete set of Woodstock contact sheets, never before seen; d) Plus an intimate foreword by none other than Carlos Santana himself. • One correspondingly numbered and signed 8×10 silver gelatin print of my iconic “Woodstock Cows” image. • One very, very rare original Woodstock admission ticket. • Free shipping to anywhere in the world (Priority Mail through the US Post Office). This book is a treasure. Whether you claim to have attended Woodstock in person or not, the images in these pages will bring you back to that mythical moment in time in rock ‘n roll music history. And it’s no exaggeration, I really believe that this is the most beautifully produced photo book in which my pictures have ever been published, and that’s saying a lot. When you get your copy, I think you’ll agree.